We love this cottage for what it is not - it isn't busy, cluttered or noisy. Mallard Point Cottage is serene, well appointed and provides guests with an immediate sense of calm with only thoughts of how many hours of lazy vacationing lie ahead. The large shaded screened porch with water views serves many functions - cozy reading nook, alfresco dining area or ultimate napping territory. With elbow room for all, Mallard Point Cottage provides spacious private bedrooms. The early riser might brew a pot of coffee and enjoy a quiet cup while watching the waterfront sunrise. Two kayaks for paddling off your private dock allows for a bit of exercise and waterside exploring. Crabbing might provide appropriate fare to accompany a bucket of beers. Crabs not running? No worries: a bushel to go from Chesapeake Landing in St. Michaels is less than six miles down the road. As you head into fall's oyster season, Mallard Point continues to delight with beautiful fall colors, warming fireplace, and billiards room to enjoy some gamesmanship. For once, finish your vacation relaxed and not in need of another one to recover. Water Toys Included: Two (2) Kayaks provided. To ensure proper sizing for your group, please bring your own life jackets, or we can recommend a rental agency. ***** The house was perfect for our 4 couples. We kayaked and tried crabbing. The location was beautiful and the House well equipped. The whole group enjoyed playing pool. ***** Beautiful secluded location on the water with great views! House is clean and has everything that you could possibly need. Screened in porch is a highlight - great place for morning coffee! We would stay here again. We loved the house, but also found ESVR did a lot to make the process of renting and staying there very easy. 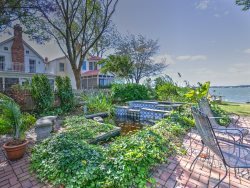 ****Adorable house right on the water! This house was perfect for our stay. It had a huge yard for kids to play in. The views were pretty and the house was very clean. It is about a 10 minute drive to St. Michaels. I love your company and think you do a great job and pay attention to details. That you have a survey like this shows a desire to respond to customer feedback which is the most important thing in any business. The company is very easy to deal with and responsive to questions. I really appreciated the little details like the New Years card and champagne, and the soaps and shampoos in the bathroom. The house was clean and well equipped, the heating worked well. The very best thing is that you are dog friendly, and that makes a huge difference for me. ****This house was perfect for me and my brothers and their kids! The lot is large enough for a football game or just sitting around talking. Beautifully set on the water with the dock for crabbing. We laid out on the dock and caught a few crabs even! We had a few events in saint michaels and that was only a 10 minute drive. For runners, the roads and sites are beautiful! The time went too fast! On arrival it was hot (88) and 1 of the 2 a/c compressors was not working. Being one of the first really hot days of spring and Memorial day week-end the HVAC service contractor was overloaded and could not get to us for 2 days. The mgt. company went out of their way to install 3 window A/C's which cooled the house down and saved the day. We had 2 young children under 3 and their room would have been intolerable without the window A/C's. The problem was quickly repaired when the contractor arrived. Thanks to ESVR for saving our week. The setting on the water and all the accommodations were outstanding and as listed and shown on the website. The house was very clean and well equipped with everything we needed. The 2 kayaks were a treat and combined with the 2 paddle boards we brought it enabled everyone to get out on the bay and my grandson caught some perch off the dock. Our family was staying for a wedding in St. Michael's and the location was great, about halfway between the church and our family living on Tilghman Island. Some of us went fishing on the Bay and came back with plenty of Rock fish which made a great meal cooked on the grill. The only suggestion would be to have a gas grill rather than charcoal . The ESVR staff is the best on the Eastern Shore. We have used their services for nine years and have never been disappointed. The new check in and check out procedures are outstanding and save a lot of time. I do, however, miss the face to face interaction. They are all great people. Mallard Point is a beautiful property. We caught enough crabs each day for seven people to have lunch. The crabbing was the best we have seen since hurricane Sandy. We all relaxed and the screened porch was very pleasant. Our ESVR vacations continue to provide the stress relief we all need. Proximity to St Michaels and Easton are a big plus!! The property was wonderful and exceeded my expectations. The kitchen had everything we needed and more. The house was lovely and well maintained. The amenities were outstanding. We loved kayaking, crabbing, and fishing. The pool table was a great hit with the grandkids. We really enjoyed ourselves and would definitely come back again.